Spring is in the air and soon summer will be here! Along with the sunshine and warm weather, spring is also prime Sea-Doo preparation time! Now is the time to get your Sea-Doo watercraft ready to go to the water! 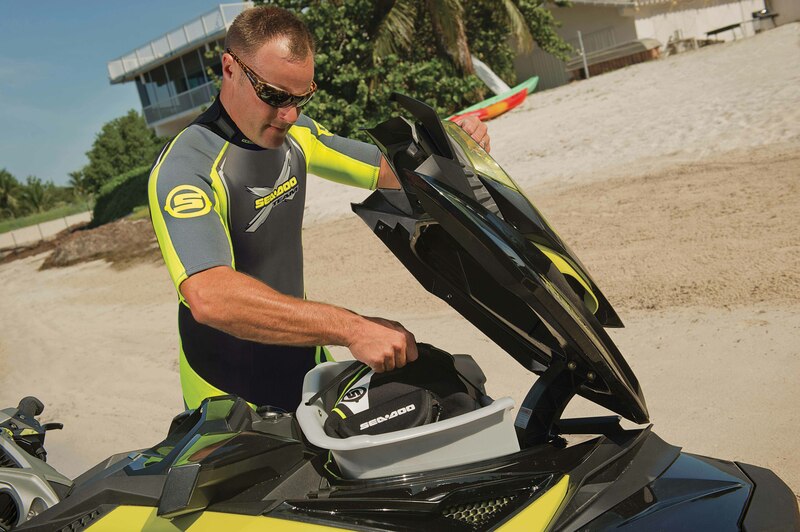 Your Sea-Doo watercraft is built to provide over a decade of fun on the water and the best way to ensure optimum performance is to take ‘tender loving care’ of your Sea-Doo. We have a full line of XPS cleaning products designed specifically to keep your Sea-Doo looking its best and last for summers to come! grim with this material safe product made exclusively for Sea-Doo watercraft. XPS VINYL CLEANER – Mold and grim can build up on vinyl over the long winter months and the XPS vinyl cleaner will help restore your vinyl seat and handlebar pad to prime condition. XPS MICROFIBER TOWEL – Ensure you protect your machine during cleaning and avoid scratching with this XPS microfiber. XPS PWC CLEANING AND DETAILING KIT – Keep your watercraft clean and protected to ensure your gelcoat, vinyl and other surfaces stay looking new with this all-in-one cleaning kit that doubles as a bucket. This kit includes: All Purpose Cleaner, Vinyl Cleaner, Spray Cleaner & Polish, 2 microfiber towels and a Deluxe Wash Sponge. XPS LUBE – Once you have cleaned your Sea-Doo ensure the moving parts, connectors and metallic parts are well lubricated with the water dispersing XPS Lube. Start your Sea-Doo riding season shiny and clean with these purpose specific XPS cleaning products from BRP. Visit your favorite BRP/Sea-Doo dealer or store.sea-doo.com for more information on purchasing these premium products. I did not get an answer to my problem.So i am not Happy. !!!! Can you please let us know what your question is? Thanks!